What do you get when you add two of my favorite Rochester-area businesses and add them together? You get to satisfy both your ice cream cravings and your cupcake cravings in one yummy container! If you're a regular, you know I love both Dollop and The Pittsford Farms Dairy. Now these two gems have worked together to bring you a new treat: Red Velvet Cupcake Ice Cream. Seriously! Beginning TODAY, you will be able to buy a quart of this ice cream made with Pittsford Farms Dairy's decadent homemade, natural ice cream and Dollop's delicious Red Velvet Cupcakes for $6.99. It is cloudy and rainy now and we just returned from Rochester's Neighborhood of the Arts, but we may get back in the car and head to Pittsford for some ice cream! 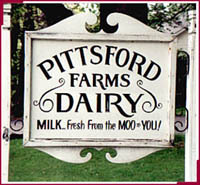 The Pittsford Farms Dairy is located at 44 North Main Street in the village of Pittsford.